The Boone Central/Newman Grove Lady Cardinals lost a heartbreaker to Laurel-Concord-Coleridge in the opening round of the Great Northeast Nebraska Shootout holiday basketball tournament Friday, then bounced back to defeat West Point-Beemer Saturday. 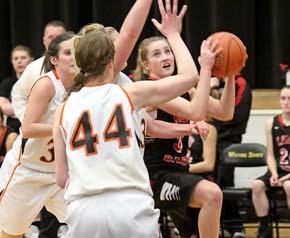 BC/NG (6-3) was scheduled to face Wayne Monday in the girls’ 5th place game at Wayne State College. It wasn’t a ‘freebie,’ but Laurel-Concord-Coleridge kept piling up points at the free throw line Friday and used a 13-point advantage at the charity stripe to squeeze out a 55-53 victory over Boone Central/Newman Grove. The Cardinals came out hot, racking up 19 first-quarter points, and held a 29-26 halftime advantage. The lead see-sawed for much of the second half before L-C-C gained a tenuous late edge. Trailing 54-53, BC/NG had two chances in the final seconds to go on top. L-C-C added a free throw after making a steal with 2.7 seconds to play, however, then swiped another Cardinal pass to secure the win. Card Coach Mike Kennedy saw some good and some not-so-good from his squad. “We came off the five-day break playing very well on offense. That was certainly an encouraging sign,” he commented. “We also did a great job on the defensive boards, holding them to eight offensive rebounds. “Our downfall was our inability to play defense without fouling. We were 7-of-12 from the free throw line to their 20-of-29. Boone Central/Newman Grove was in the zone Saturday morning. The Lady Cardinals used a stifling zone defense to shut down West Point-Beemer in consolation play at the Great Northeast Nebraska Shootout and earned a 42-30 victory over the Cadets. West Point-Beemer did not have double figures in a quarter until scoring 10 in the final stanza. By then, BC/NG had rolled up leads of 24-11 at halftime and 37-20 through three quarters. “This was a good win for our team. It was a great way to get past a disappointing first-round loss by getting right back on the court and competing again,” Kennedy said. “We were very solid in our zone defense, holding West Point-Beemer to 17 percent shooting from the field. We also accumulated 55 rebounds – our strongest rebounding effort this season.